Scotland's biggest abattoir has halted operations because of the gas shortage. Booker said in a statement: "Due to the international shortage of CO2, we are experiencing some supply issues on soft drinks and beer. "We are currently working hard with our suppliers to minimise the impact for our customers and cannot comment further at this stage." Heineken said its John Smith's Extra Smooth and Amstel brands had been hit, while Coca-Cola Great Britain said production had been interrupted until fresh CO2 supplies arrived. "We are currently responding to an industry-wide issue that is impacting the supply of CO2 in the UK. Our focus is on limiting the effect this may have on the availability of our products," Coca-Cola said. Small UK bottling firms have also been hit. In the West Midlands, Holden's, which has 80 customers, shut down last Friday until further notice. "I'm left with people sitting around doing nothing," said operations director Mark Hammond. Supermarket Morrisons said some frozen products had been affected by the shortage, and it aimed to resume selling its full online range "as soon as possible". The food and drink industry hopes that supplies will begin returning to normal in early July, although trade bodies have complained about a lack of communication from CO2 suppliers. Andy McGowan, chief executive of Scottish Pig Producers, a co-operative that runs the Brechin abattoir in collaboration with QPL, said he did not know when they would get a fresh CO2 delivery from their supplier. "That's the frustrating thing - they're not telling us anything. We're pretty dismayed. The top priority is animal welfare - we will not have ourselves in a situation where the welfare is suffering," he said. Poultry slaughterhouses have already called for priority supplies of dwindling CO2 stocks, saying the current shortage could have a "potentially huge effect" on British food production. 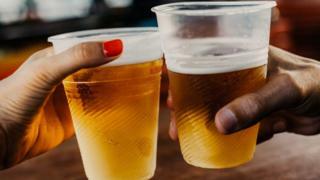 But that call for the food industry to be given priority has raised fears among drinks firms and smaller businesses that they will be at the back of the queue when gas supplies start to return to normal.